Clare are expected to appeal Kelly’s ban, while Roscommon’s Donie Smith could be facing a suspension. Tony Kelly leaves the pitch after being sent-off. TIPPERARY BOSS LIAM Sheedy has admitted that Tony Kelly’s sending off had a big say in the outcome of the Premier’s 2-16 to 1-11 win over Clare on Saturday night. Kelly was dismissed on straight red nine minutes after half-time for a robust challenge on Padraic Maher. At that stage, the Banner were five points behind but had a strong wind at their backs for the second-half of the Division 1A meeting at Semple Stadium. However, the game turned from there and shortly after that two goals in as many minutes from Seamus Callanan put significant daylight between the sides. “It was absolutely accidental and it was unfortunate for Tony but it had a massive bearing on the game,” said Sheedy afterwards. A big moment early in the second half as @GaaClare Tony Kelly sees red! Clare are likely to appeal the red card in a bid to have the former Hurler of the Year available for Kilkenny’s visit to Cusack Park on Sunday. 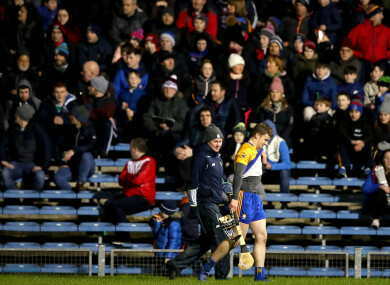 “We were coming back into the game and I couldn’t really see it but a lot of your colleagues told me, from looking back on replays, it seemed to be quite harsh,” said Clare’s joint-manager Donal Moloney. “There were only four points in it at the time. That is the way it goes. “Tipperary took (the goals) very well. We saved a penalty in the first half as well and they put another penalty over the bar. Tipperary were ahead of us. “The lads will always battle, the team will always battle away and we admire them for that. We just need to get back up to match sharpness. “We have a lot of work to do across a lot of our team. We brought on three lads, Peter Duggan, Podge Collins and Colm Galvin, they are all short of training because of injuries and match time as well. Meanwhile, Roscommon forward Donie Smith is facing a retrospective ban after an ‘eye-gouge’ incident with Keith Higgins during their Division 1 meeting on Saturday night. Both James Horan and Anthony Cunningham stated afterwards they did not see the first-half clash between the players, where Smith’s hand appeared to make contact with the Mayo defender’s eye. Referee Barry Cassidy did not sanction Smith, meaning the Central Competitions Control Committee (CCCC) can take action. But Smith may not be looking at a lengthy ban, given Philly McMahon missed just one game after a similar incident in 2015. The Dublin star was banned for one match after his fingers made contact with Kieran Donaghy’s face in the 2015 All-Ireland final. Dublin appealed the suspension but after reviewing video footage, the GAA’s Central Hearings Committee upheld the proposed ban and he missed the first game of the 2016 league. Email “'It was absolutely accidental' - Sheedy admits Tony Kelly's red card was harsh”. Feedback on “'It was absolutely accidental' - Sheedy admits Tony Kelly's red card was harsh”.